AVENGERS: INFINITY WAR brings together the most powerful heroes across the universe to battle environmentalist dictator who believes overpopulation is destroying the universe and so wants to wipe out half of the universe. AVENGERS: INFINITY WAR is an exciting, humorous spectacle and has a strong moral, redemptive worldview with some heartfelt moments, but it sometimes gets lost in its own scale and includes some negative elements, including occultism, human sacrifice, intense violence, a ruthless protagonist, and too much unnecessary foul language. Extreme caution is advised. The movie opens with Thanos on Thor’s spaceship which holds the last of the Asgardians. Thanos and the goons who worship him have killed almost everyone on the ship and have easily beaten Thor and Hulk so Thanos could obtain the tesseract, which contains one of the five infinity stones he wants. Before Hulk is killed, Heimdall transports Hulk back to earth through the Bifrost Bridge, but Thor is left for dead in space. Thanos tells his powerful soldiers to track down the other infinity stones on Earth, One of them is held by Doctor Strange in New York, and another is on Vision’s head in London and works as his power source that gives him life. Hulk/Bruce Banner lands back in New York City and warns Strange and Tony Stark that Thanos is coming. Moments later, Thanos’ henchmen show up in New York and start battling Doctor Strange and Tony. Peter Parker/Spider-Man shows up just in time for the fight. Back in space, Thor’s rescued by the Guardians of the Galaxy (Peter Quill, Rocket Racoon, Groot, Drax, Gamorah, and Mantis). Thor informs them that Thanos is collecting all the infinity stones. Gamora explains that if Thanos, her stepfather, gets all the infinity stones, he could alter all of reality in a snap of a finer. It’s revealed that Thanos believes the universe needs balance, and because of “over population,” half the sentient beings in the universe should be killed to restore nature and save the other half. If Thanos gets the stones, he’ll be unstoppable. Meanwhile, the infinity stone on Vision is in danger. So, Steve Rogers/Captain America, Falcon, Scarlet Witch, and Black Widow take Vision to Wakanda for safety, where King T’Challa/Black Panther will help battle any army that comes to get the stone. Will the Avengers be able to stop Thanos before he commits genocide and obliterates half the universe? 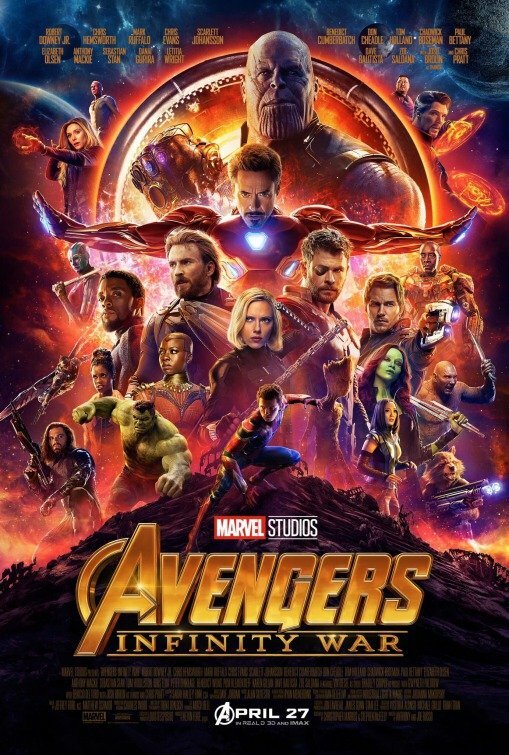 AVENGERS: INFINITY WAR is impressive in that it ties together dozens of superheroes spanning 18 movies released over the past decade into a cohesive plot. Within the first five-minutes, the villain is established, the stakes are determined, and the jeopardy is high. The excitement that follows is nearly non-stop. Where the movie succeeds the most is the despicable, and very intimidating villain Thanos, who’s actually the driving force of the story. In fact, Thanos is really the protagonist, even though the movie encourages viewers to identify with the Avengers, the antagonists. Josh Brolin brings a great gravitas to Thanos, whose enormous figure and deep voice demands attention. Smartly, the movie is full of humor, even in some of the most intense battle sequences. The humor adds much needed levity. INFINITY WAR isn’t without flaws. A couple scenes were noticeably shot on green-screen and have what can simply be described as fuzzy CGI. Also, without giving out spoilers, the movie’s ending is a downer, and the nature of the twist at the end may force the plot of the next AVENGERS movie to undercut some of the plot choices made in INFINITY WAR. Not uncommon in comic book movies, many of the high stakes situations are solved by Deus Ex Machina (artificial magical plot devices, such as multiverses). Sadly, INFINITY WAR has mixed worldview elements. Negatively, there are occult and New Age elements, mostly surrounding Doctor Strange who levitates through meditation, but it’s not quite as strong as it was in the standalone DOCTOR STRANGE movie. Thanos also acts as a god to his subjects and considers his genocide to be “mercy” to save the environment, but this is strongly rebuked. One of his henchmen tells people to “meet their creator” before killing them. Thanos’ motivations are actually one of an environmentalist dictator who believes overpopulation is destroying the universe but places no real value in sentient or human life (shades of Thomas Robert Malthus and his followers such as Al Gore and Jerry Brown). However, the movie offers no strong counter to such misanthropic, evil environmentalist views, and (SPOILER) Thanos actually defeats the good guys at the end. Despite that, INFINITY WAR contains some strong moral, redemptive elements of self-sacrifice, protecting every life, fighting genocidal tyrants, and some pro-marriage statements. There’s also a reference Star Lord makes to Jesus being a master, but it’s not said in the most respectful of tones, so it could be taken different ways. Finally, two of the Avengers make the fatal mistake of letting their anger control them, so there’s a positive lesson in that for discerning media-wise viewers and families. On the content spectrum, INFINITY WAR isn’t the most violent or profane of the Marvel outings, but it’s also not the cleanest. There are very intense fight scenes with shocking deaths, though there’s very little gore. Though mostly light, too much foul language warrants strong caution for all viewers, especially several misplaced “s” words and light profanities. It took 10 years for Marvel to get to this storyline, and to give credit due where credit is deserved, the studio delivers a massive movie. The movie is so big however, it may be too big for its own good. Also, some of the characters, especially Star-Lord and Thor, have similar action sequences, which makes it hard to tell “who is who.” To the filmmakers’ credit, there is a very funny scene between Star-Lord and Thor, where Star-Lord starts talking like Thor and comments fly about how similar they look. Also, there are moments where several characters reach emotional depths not seen before, but because so many characters demand attention, some powerful moments are easily overlooked, particularly between Stark and Pepper Pots, and Star-Lord and Gamora. As far as storytelling goes, that’s a missed opportunity, though it does add some depth to the movie. That said, Marvel and Disney have sold the movie as a thrill ride with endless hero mashups fans have been dying see. So, most moviegoers will find AVENGERS: INFINITY WAR immensely entertaining, even with the tragic, rather shocking cliffhanger ending. Kidnapping and angry vengeance from a couple heroes fatally threatens the mission to defeat the movie’s genocidal protagonist, plus characters are told to “meet their creator” before being murdered. AVENGERS: INFINITY WAR reunites earths mightiest heroes from the previous 18 movies in the Marvel Cinematic Universe to fight their greatest foe yet, Thanos. A powerful Titan, Thanos, wants five powerful ancient stones that will make him the most powerful being in the universe. With these stones, Thanos, a genocidal environmentalist dictator who believes overpopulation is destroying the universe, can accomplish his plan to eliminate half of the population so he can enjoy nature. Can all the Avengers and their friends band together to defeat the mighty Thanos? AVENGERS: INFINITY WAR impressively ties together dozens of heroes from a lot of different movies in an immensely entertaining movie. It has abundant heart, humor and action, but the movie’s vast scale and downbeat ending keep it from becoming one of the great superhero movies. INFINITY WAR has some strong moral, redemptive messages, including self-sacrifice, but it’s also mixed with occult elements and pagan, environmentalist statements that aren’t refuted. Finally, AVENGERS: INFINITY WAR contains lots of intense fighting and gratuitous foul language. Most moviegoers will enjoy INFINITY WAR, but extreme caution is advised.